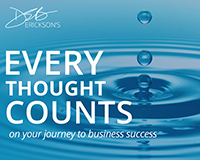 Every Thought Counts Opt-In - ICAN Institute Inc. Put your brain in the fast lane and supercharge your business with this FREE audio training. This audio training is specifically designed for women in network marketing and direct sales, and will help you change your internal self-talk and rewire your thinking to get the desired outcomes for continued success.